John Stott | Live today – build on age-old foundations! During our time in London last week, I reflected on the impact that John Stott has had on my life. John Stott is now 90 years old, and I have heard that he is quite weak in his body. His life has been significant in many ways, especially in the realm of evangelical theology. In the 1980’s, I met John Stott several times, especially because of my role in the Lausanne Committee for World Evangelization and the Norwegian Lausanne Committee. I was also fortunate to visit John Stott several times, both in his church, All Souls Church, Langham Place, of which he was known as rector emeritus, and in his home. I was never close to him, but he clearly took interest in me as a young man who needed to be developed theologically. John Stott often smilingly referred to me as “the young pentecostal”. 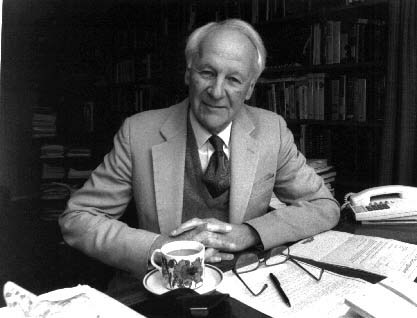 In a general sense, John Stott has impacted the whole evangelical world with his decisive role in writing the Lausanne Covenant. For me personally, his greatest contribution was in helping me to understand theologically the social implications of the gospel. He also challenged me repeatedly to rethink my conviction about the baptism in the Holy Spirit. Even though I have never changed my opinion on this, he certainly helped me to have a richer and fuller understanding of the Holy Spirit. John Stott is one of my heroes of faith!